2001 - Osado, bay PRE (Andalusian) colt by Toboso. Owned by Erin Logan / Red Wolf Ranch. 2002 - Pecado, pearl buckskin Azteca D colt by Certain Sin. Owned by Nancy Baker/Fantisy Farm. 2003 - Caminar con los Reyes, grey (born bay carrying pearl) PRE (Andalusian) colt by Gabeño®. Owned by Laurel Dedes, Persimmon Hill. 2004 - CP Dacelo, light dapple bay PRE (Andalusian) colt by Valentino IV. Owned by Charmaine Winchcombe/Cherrox Park. 2005 - Ocicat, pearl chestnut Iberian Warmblood colt by Camlann[TB]. Owned by Martha Baker/Dreamland Farm. 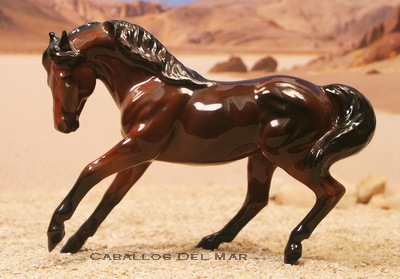 2006 - SMS Perfecta y Fabulosa, black bay PRE (Andalusian) colt by Conquistador XII®. Owned by Sarah Fritz/Shady Maple Stables. 2007 - Milagro C, grey PRE (Andalusian) colt by Cristobal. Owned by Kay Myers/Caballos Del Mar. 2008 - You And Tequila, black Andalusian (PRE) colt by Toboso. Owned by Natasha Powers/Powers Farm, FL. 2009 - Neptuno, bay Andalusian colt by Arlequin. Owned by Autumn Rupert/Twilight Mirkwood. 2010 - Socratees, gray Andalusian colt by Cristobal. Owned by Autumn Rupert/Twilight Mirkwood. 2011 - OTE Regrets And Romance, bay Andalusian colt by Arlequin. Owned by Curtis Sayers/Oak Tree Equestrian. 2012 - Astucia C, bay Andalusian (PRE) filly by Fiero LFA®. Owned by Kay Myers/Caballos Del Mar. 2013 - Harlequin Prince, bay Andalusian colt by Arlequin. Owned by Natasha Powers/Powers Ranch.